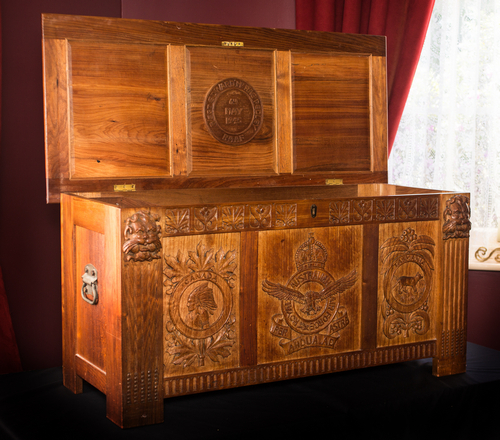 Chest carved 1945 for Ted (Edward) Pedley . Who was Nellie Payne? Chest carved for Ted Pedley. Ted is the eldest son of Mollie (née Field) and Henry Pedley. Mollie was one of Nellie’s elder sisters, hence Ted was Nellie’s nephew. Ted was born in 1924 and grew up on the family farm “Craythorne”. He joined the air force for the Second World War, hence the airforce and Canadian symbols on the chest. After the war he came home and became an articled student with Cowans Surveyor in Launceston in 1946, then registered as an architect in 1951. During those years he had to go to Hobart to sit exams and used to stay with Aunt Nellie and Madge. He remembers Nellie working in her studio out the back, and often having a rash like dermatitis as a result of often working with blackwood. For Ted’s 21st birthday in 1945, Nellie carved him a chest, which he still cherishes. For Ted’s engagement to Peggy Carrington, Nellie embroidered them a pair of pillowslips, as she was also very talented with the embroidery needle. These pillowslips are still treasured by Ted and Peggy’s daughter who lives in Sydney. Ted and Peggy have worked copper door plates on their home in Launceston. These were worked by either Nellie or her sister Ethel. They also have a framed piece of needlework that was worked by one of Nellie’s elder sisters, Elizabeth Sarah, known as Lizzie.